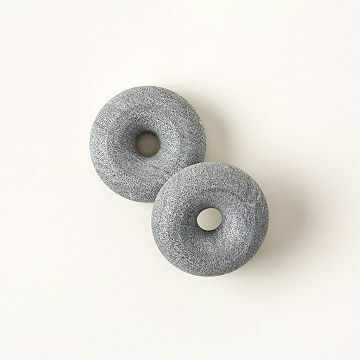 Made from Finnish bedrock that is more than two billion years old, these stone disks bring tired peepers relief from long hours at the computer, puffiness after a long night, or itchiness due to seasonal allergies. Chill them in the refrigerator and apply on or under your eyes for a rock-solid spa treatment at home. Made in Finland. After spending my day in front of the computer I come home from work and lay these on my eyes for about 15 minutes. They help awaken tired eyes! I really liked the idea of these and they do work for eye puffiness and feel very refreshing. I had a really hard time keeping them in place on my face. I'll have to read other reviews and see if there is any advice but they felt like they were sliding off or moving a lot. I'm sure there is a quick fix but it was a little frustrating. Put on eyes to relieve puffy bags. Put in the fridge and apply to eyes!! RELAXING!! I get bad headaches behind my eyes and these really help. I bought them for my boyfriend as well. He also likes them. Bought two of these as gifts and both recipients LOVED them and said they work. Best under AND over eye puffiness relief! I use these in the morning before washing my face and applying light makeup. I am currently leaving them out at room temperature and the coolness is perfect (but, it is winter!). May need to put them in the fridge briefly when summer comes. They greatly reduce the puffiness below AND above my eyes. Other reviews suggest they don't they stay in place, but I haven't had any problems. You do need to adjust them just right and lay almost flat (I very slightly elevate my head on the pillow). I wear them for about 10-15 minutes and it does the trick. Oddly, I can even see better after wearing them! A unique, special gift for self pampering fun! I bought this as a present for myself & loved it so much I will surely purchase as gifts for others in the future! It easily fit my petite face, and feels cool and light to relieve pressure & relax.